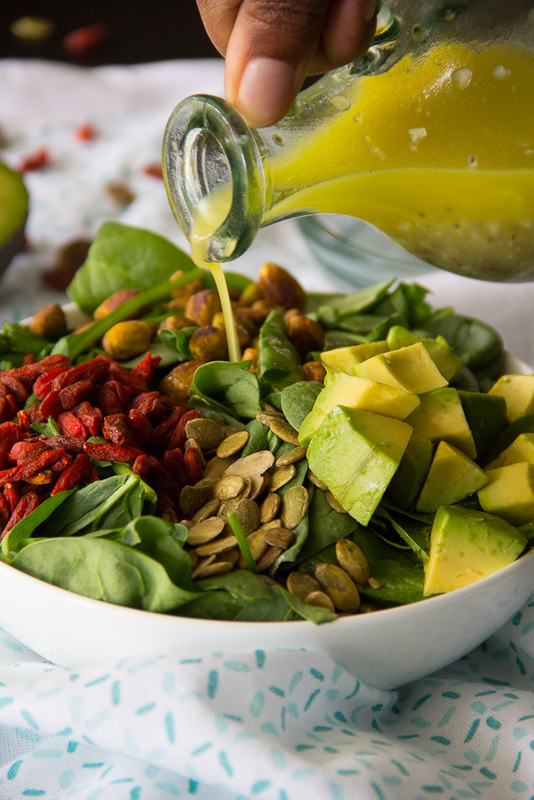 This nutritional bed of spinach topped with crunchy pistachios and pumpkin seeds, creamy avocado, and juicy goji berries gets drizzled with a healthy balsamic chia seed vinaigrette. This Power Salad is an excellent choice for your lunch today!! Happy Monday!!! Surprised to hear from me so early in the week? I’ll actually be guest posting over at Gather for Bread again this coming Wednesday and I just so happened to have two posts for this week. Yeaaaa!!! And I guess I’ve been in a salad kinda mood lately because I’m also posting another great salad over there this week so look out for it!! We lost power this past week and I needed to think on my feet and create something that wouldn’t require a hot oven but still be as equally delicious. I’ve been feeling kind of blah lately so I thought I’d throw something together that would use up some of the super foods that I happened to have on hand. I came up this yummy Power Salad with Balsamic Chia Seed Vinaigrette. 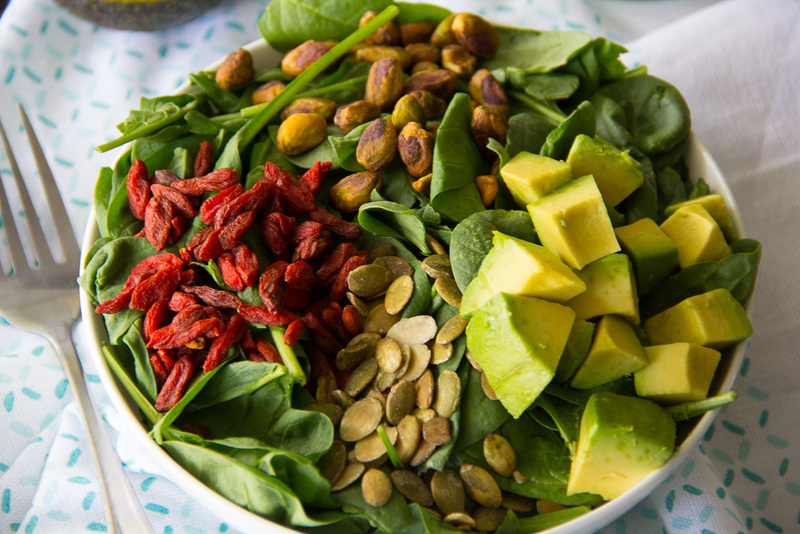 This Power Salad with Balsamic Chia Seed Vinaigrette features pistachios, pepitas, avocado, goji berries and of course the obvious, chia seeds. What’s your take on chia seeds? Super food or No? I’ve read that they are a great energy booster; of which, I could always use to a wee bit more. Chia seeds are loaded with protein, fiber, essential fatty acids and antioxidants so it sounds like a super food to me!! I’ll let you weigh in though. This Power Salad with Balsamic Chia Seed Vinaigrette reminds me of the Power that God has given us through the gift of other tongues. You see, when you pray in other tongues, it causes the mind to yield to your spirit. Praying in other tongues allows you to pray out the perfect will of God in your life. It’s the very spiritual weapon that you need, especially right now in these perilous times to combat the schemes of the enemy. If you don’t speak in other tongues, ask God to teach you. It is certainly the weapon of Power which makes you unstoppable unto His Glory. Say Grace and enjoy!! 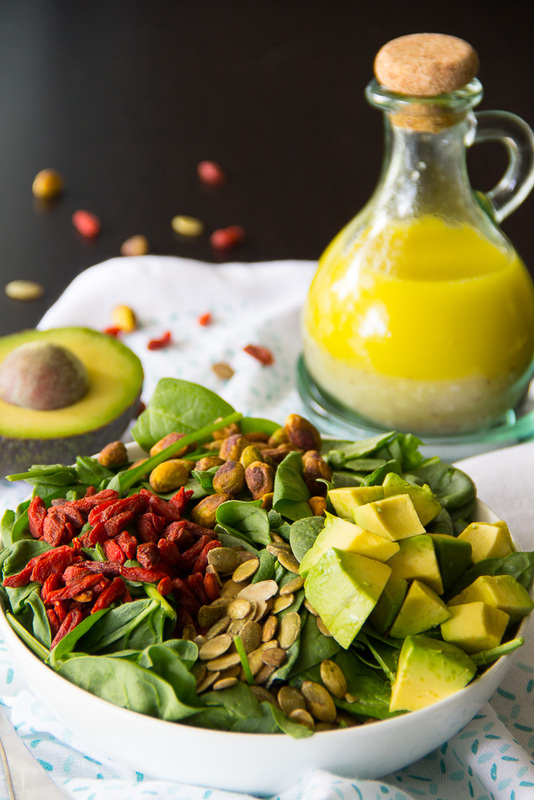 Combine the spinach, pistachios, pepitas, and goji berries in a large bowl. 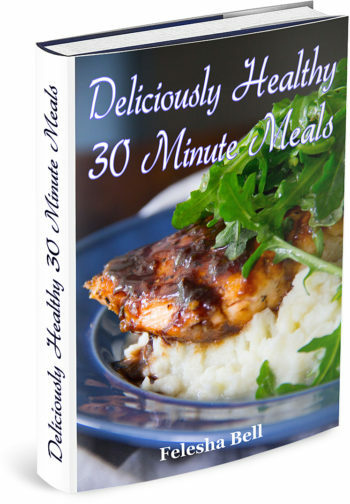 Combine the balsamic vinegar, lemon juice, garlic, mustard, salt and pepper in a bowl. Whisk until combined. Drizzle in the olive oil until emulsified.